As I mentioned on another thread, for N's birthday I made a lemon-raspberry cake from King Arthur Flour's whole grains baking book. The cake uses both regular AP flour and whole-wheat pastry flour (which I had to specially order), giving it a slight nutty texture; the batter is made lighter by the addition of 5 egg whites. I had read a review of the recipe which said that the 1/4 cup of raspberry jam filling was far too little, so I had N set aside a 1/2 cup when she made the jam. The reviewer was right; 1/2 cup was just right, and maybe even not enough--a 1/4 cup would have been completely overwhelmed by the lemon buttercream. Speaking of buttercreams, I was surprised that KAF advocated the use of shortening in both its regular and "easy" buttercream recipes. I guess adding shortening makes it fluffier, but I don't think I'd like the taste or the texture. (IMO, shortening should be reserved for pie crusts. Maybe.) I adapted the easier recipe to make it all butter. The cake tastes very good, but what I made won't win any beauty contests: one of the layers broke in two as I added it on top of the other layer, so frosting the whole thing was a real mess. I am reminded of a bistro in Wiscasset, Maine, Sarah's. Desserts were a specialty. Downhome desserts. Cakes that looked like you made them at home on a harried day. Embarrassingly lopsided and mucked up frosting cakes. But they each and every tasted divine. And in the larger scheme of things, isn't that what desserts are about? Please, no apologies! I almost prefer it when cakes look a little gross. That's kind of what I want in a dessert. My wife always thought I was being polite when I said that to her. But she should have known me better than to expect me to be polite. The art of camouflage - that's what frosting is for! N was happy, and she loves the taste. The lemon in the buttercream really comes through. Yeah, cuz N Gets It. Made a birthday cake for the boy's 4th birthday. White cake, chocolate buttercream. I need to work on my writing with frosting skills. Happy Birthday to your little Leo. Oldest granddaughter turned 7 yesterday. She and I made her birthday cake, what I call a "dump cake". A sponge for which you beat yolks and sugar together, then dump whipped whites, flour and melted butter on top and quickly fold together. Seems improbable but makes one of the most versatile and reliable cakes I know. 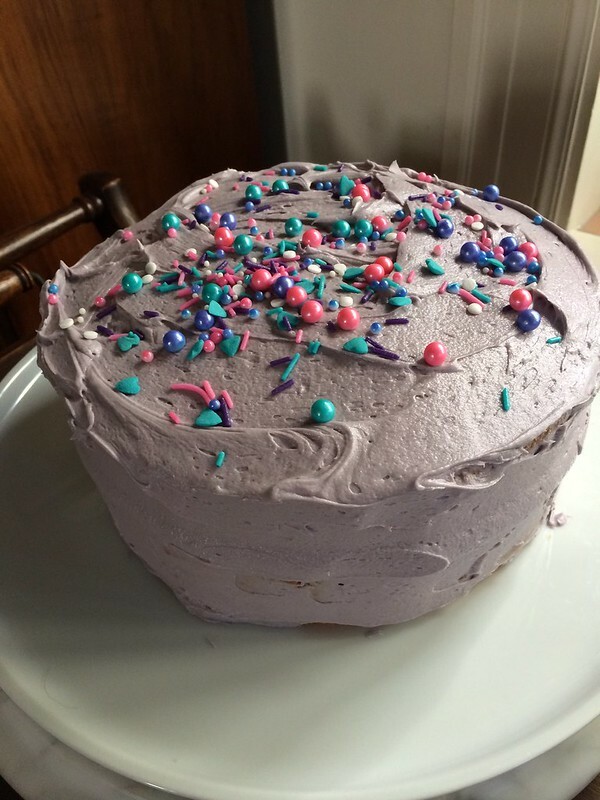 Lightly lemon flavored with lemon butter cream frosting, tinted mauve by her and showered with pastel sprinkles. These last two exercises she enjoyed most. Luckily for you, he probably can't read yet. Earlier this year he promised me that he would learn how to read when he was 4. I think I need to remind him of that. Let's hear it for July 22nd kids! All last week the boy kept asking me when would we make his birthday cake (we baked muffins and a rhubarb custard cake earlier in the week) but he wasn't home when I made it so he was surprised. He was actually a bit disappointed by the cake as we've promised him a PJ Masks party and he expected the cake to be PJ Mask-themed. I had to explain to him that he'll get that cake at the actual party (which we have yet to plan). I'm going to have to order that one. The birthday girl cut and served the cake, bowed to rave reviews and when asked what cake she wanted for the "bouncy house" party next Saturday for her peers replied, "This one." Ain't gonna happen, but a sweet thought.. If you have reason to be in the burbs we've found there is a huge cost arb on cakes of that ilk. we did minion cupcakes for AB^2's fifth @ school and it was shocking the price diffferential. I made the Jordan Marsh blueberry muffins tonight. These are very good muffins, and it's difficult over bake them because they are so packed with blueberries, they can't possibly be dry. That makes these the ideal muffins for me, since i can't be bothered to take them out of the oven as soon as they're done (I use my Breville Smart Oven, so the oven turns off when the timer goes off, but the residual heat will dry things out if you don't take them out within a reasonable period of time). I still have blueberries left, so if I can find the energy and motivation, I will bake another batch tomorrow.